Five Adventurers joined me in Belize including one add on in Roatan with four of us flying ATA from Roatan to Belize City. Doctor Sharon flew in Friday afternoon and our last guest joined us on Saturday at the dock. I will be posting pictures as they become available and hope that we get some contributions from the other guests. I will caption the pictures as time permits. 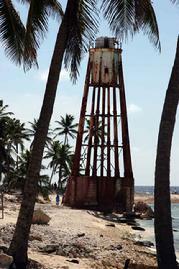 The Great Blue Hole at Lighthouse Atoll Belize from Reed Nescher on Vimeo. Click here to purchase a lease on any off these pictures and to read about it & See more pictures! We partied as long as we could with the group we were leaving behind. Kevin had made his arrangements to get his ticket to Belize and we were all packed and ready to go at 5:30am. Friday the 25th. This personal note about the air service, I have found out that there is only two flights a week between two of the worlds best dive destinations Roatan Honduras and Belize. Although they're only ninety miles apart from Roatan to Belize City it is a half-day adventure to get it done. In the past I have missed the flight to find out "you can't get there from here" unless you want to spend two days on a bus after a fairy ride and maybe plane or two, so don't miss your flight. Ours was arranged by Roatan Charters who have done a great job in the past for me. So it goes like this the flight is scheduled for 6:30am and you're supposed to be at the airport two hours before the flight. The airport does not open until 6:00am. So you can't even get in until 6:00am. Having done this a number of times I know the drill we get to the airport at 6:00am as it opening and check in at the ticket counter. Then they had searched all our bags at a table and then give them to the counter person for check-in. Then you clear your passport control and your visa as well as making sure you have paid your airport tax and then through security. Takes about forty-five minutes, but no problem the plane is never on time! So we set and wait, this time until 10:00am, but we are told it will now be a direct flight, but as we get on the plane I notice it is a larger than normal plane for this trip. I ask the flight attendant where we are going. She told me La Ceba on the Honduran mainland. Okay I have been hear before traveling to Belize, so I thought we would as in past leave from La Ceba and that was the direct flight to Belize. Well we got off the plane in La Ceba and went into the new airport that is much nicer that the old tin shed that use to be the airport. It is now a nice modern airport under any ones standards. We had noticed back at the Roatan airport that a young lady had come into the waiting area through security and had all her tooth past and lotions taken. She sat down and went to sleep on the seats. Now she was coming out of the restrooms in La Ceba and asked us "If we were divers as she had thought" and we said yes to which she asked us about a rash that was developing on her neck. We asked her what she had been doing and she told us the following story. Seem she was from Finland and was traveling the Americas for vacation. She had gone to Utilia and decided to take SCUBA diving lesions there. She went to a local well-established dive operation on Utilia, which will remain anonymous for obvious reasons, where she would take lesions and do eleven dives during her training. On her tenth dove her instructor had taken her to 200ft, that's right to 200ft on his computer, she didn't even have her own computer for a dive that shouldn't have been made by the instructor let along have taken a student to this depth! We did a number of tests on this girl who less that 24hrs ago had been to 200ft. She was tired and her skin itched as well as a rash on her neck. We took down all the info from her logbook including her instructor's name and instructor's number for later. We suggested she might want to visit a doctor and a chamber and if she continued on her flight she might risk further problems. She told us her final destination on this part of her trip would be Mexico City. We told her it was above 7000ft in altitude and might add to her problems. She insisted that she would be okay, yet complained the whole time we were with her. This young woman did not realize the potential problems that could arise from her decisions. In an hour we were boarding the size plane I had taken to Belize before and was told this was the direct flight to Belize. Our new friend was aboard with us and we said we would keep an eye on her just incase. Wow, I wished she would have gone to see a doctor, but it was her choice. Now we were on our way, off the ground we headed up the coast and then inland to San Pedro Sula for the next leg of our direct flight. We landed and this time only let two people off and picked up two more for their direct flight to Belize City. One hour later we were landing in Belize City around 12:45pm had to fill out Customs forms and Visa applications to clear passport control. Then we picked up our luggage and headed for custom. I was asked the reason for the visit and I told the agent we were doing the Belize Aggressor III to not much response at which he wanted to inspect my camera case. This is something you get used to traveling with the equipment that I do. We started to chat a little and I asked if he know the one of the old DM's on the boat named Wolf, he started to smile and asked me how long I had known him. He was now all smiles and talking about Wolf and diving and what he was doing now, it is great to get to know people in a small country, where everyone knows just about everyone else. We went right out the door and my good friend Jim was waiting with his new Van Taxi Cab to take us to the Radisson Hotel for our Friday night stay. Doctor Sharon Laughlin was coming in from LAX via Huston at 2:55pm. I told Jim and he called his wife who works at the Board of Tourism of Belize. He wanted to make sure he had time to drop us off and get back in time so she would not be alone at the airport. Well when "Doc" arrived she was asked by airport official if she was Doctor Sharon Laughlin and she thought she was in for a cavity search, instead she got the VIP treatment thanks to Maria and Jim was right there to pick her up. Thanks to Jim & Maria, two people that I have come to really like and epitomize the hospitality of Belize, we were five sixth in Belize. Jennifer was to arrive the next day at 2:55pm, but the Aggressor was picking her up and we would catch up to her Saturday on the Boat. With that out of the way it was time to firm up plans with Jim, he is a licensed tour guide, for Lamini Mayan ruins on Saturday morning. After all the arrangements were made and we check into the hotel we headed for the Bar Restaurant at the hotel that over looks the dock where the boats dock. We ordered as if we were hungry and we were, eating all but a few peaces of Pizza that John had ordered. While we were waiting for or food Doc came in and joined us with a big smile and the airport story. She had already checked in just two doors down from Kevin and I in the tower building. We were now all her except Jennifer who was in an airport some place in the world. We sat and laughed at Doc's story and checked out the gift shop with her. It was the end of an interesting day of travel and adventure for all of us. Everyone realized just how tired they were and we all headed to our rooms for a good nights sleep, as morning would come early. Saturday the 26th arrived on time with an early morning call to the desk for Bell service to store our gear until the afternoon. We gathered up the gear we would need for our adventure into the jungle and headed for Jim's van. 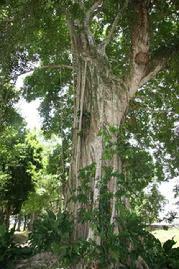 We headed north on the main highway towards Orange Walk where Jim had arranged a boat and guide to take us up the Belize river to Lamini, that means underwater crocodile in Mayan, we shared our boat and guide Orlando with some younger Dutch and European travelers. We boarded the boat in Orange Walk and headed west up river for a twenty-five mile trip to the Largest of Central Americas Mayan ruins that sit on the banks of a large lake with the Rain Temple reaching above the jungle and overlooking the shoreline. We moored the boat just ahead of a huge thunderstorm with wind, lighting, and driving rain that blew through in twenty minutes or so, just enough to cool it off a little, it was perfect timing to say the least. We headed for the museum first to get an idea of the size of the site and the history of its inhabitants over the years. Orlando then gave us an excellent tour of the site with the names of plants, flowers and trees as well as Mayan culture and history. We visited a number of smaller temples sites and climbed the Rain Temple to over 100 meters above the jungle floor. We were shown the Ball Court and the marker stone where the only known Mercury in its natural state in the Mayan empire was found by Archaeologists. We ended up climbing three of the temples that in recent years have seen the mass herds of cruisers from the cruise ships that now come on Tuesdays, Wednesday, and Thursdays. Those days would not be the days to be on a temple with hundreds of people going up and down. We were one of maybe three groups of nine or less that were seeing this beautiful man made wonder in the capable hands of Orlando. We finished our tour and had a traditional Belizean lunch of roasted chicken, beans and rice with some coleslaw and fried plantains topped off with soda and bottled water. Everyone was very happy with lunch the food was very good and the location was dramatic to say the least. Jim had done well and knows all the right outfitters to get the job done right. We headed back to Orange Walk on the boat at high speed stopping once and a while to see if we could see any crocodiles or other wild life. The river was running at flood level from a month of heavy rains that had just ended. Normally August is one of the dryer months in Belize, but not this time, as I had noticed flying in that everything looked a little wetter than normal. The boat ride was a blast as we slipped around corners at high speed over the flat calm mirrored water. We arrived back at the dock with all smiles and a great adventure under our belts. We all kept talking about all the people we know who would love this kind of trip and I think Kevin was glad that he had decided to come along regardless of him missing or delaying his trip to Northern California to see a friend. I had brought in my dry bag my still and my video camera for this one and got a lot of great pictures and video. The adventures was continuing and everyone wore big smiles all the way back to the hotel. This charters crew: Captain ? Jay, 2nd Captain ? Jon, Instructor ? Raul, Dive master ? Nadia, Chef ? Thelma, Steward - Randy. This charters guests: Theresa, Rosemary, David, Reed, Kevin, Allison, Jennifer, Chris, Doc, Gray, Terri, Mark, Debby, John, Sharon, & Mark. After setting up and settling in we grabbed a drink and hit the sun deck bar until dinner. Dinner is served at six thirty and we eat the first one in the salon to meet everyone and listen to any announcements or instructions by the captain or crew. We had not seen Jennifer to this point, but heard that she had come aboard and was tired and going to catch some sleep instead of dinner after traveling all night and a nine hour layover in Atlanta via Delta Airlines. We had flown Continental and ATA and it makes it a much shorter trip. After dinner the Captain requires a safety and orientation briefing that is mandatory for all to attend. That was our first meeting with our sixth member of our group a sleepy Jennifer. After the briefing and some greeting we were free to enjoy ourselves with the only stipulation be on board by 5:30am as we will be leaving sharp. John and Doc commandeered one of the crew to bring back some rum for the trip and he was back in no time at all so that there was time to have a nightcap on the top deck. We all just kicked back and relaxed knowing a full week was ahead of us of diving and having fun. Jennifer went back to bed to catch up on lost sleep time and Kevin hit the sheets early enjoying his vacation time. Deb, John, Doc, and myself kicked back and enjoyed the breeze on the Sun Deck of our private dive yacht that would be taking us to new adventures on the Atolls of Belize. Sunday the 27th started at 5:00am with the diesels starting with the sound of the air starters. Some didn't even hear them start by 5:30am we were on our way to Turneffe Atoll and Three Anchors as our first dive site. We all got together for breakfast and got our dive briefing, which are thorough to say the least, and some headed for the wall while others headed for the coral heads and Macro stuff. Some saw two Eagle Rays on the wall and the others saw eels and lots of critters. Below is a map of the Atolls and dive sites of Belize. 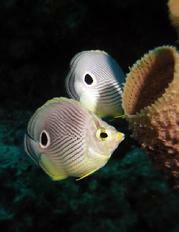 We did two dives at this location, which is the common practice of the BAIII. The first dive you go deep or to the left or right and the next you do the opposite. I like this method and it allows me to find stuff with either camera and then go back with the other. After the first dive we shower of under the Caribbean sun and head for the Sun Deck and a quick snack of sticky buns or some other sweet treat. Dry of between dives and get the camera ready for the next and find out what and where the divers saw things that I might get on the next dive. Then it was time to dive again and look for all the good stuff you didn't find on the first dive. After another productive dive we repeated the morning routine except it was lunchtime as we headed for Lighthouse Atoll and more great dive sites. We had Randy the Steward know we were going to eat on the Sun Deck and he brought us Silverware on place settings up for us, he was really great and we enjoyed being pampered. We moored at Aquarium for the next three dives including the night dive. We found lots of photogenic corals, sponges, swim throughs, and fish all just waiting to be found and captured on Digital and Video. 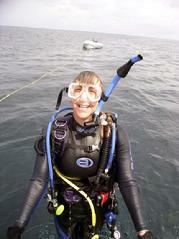 On the night dive I pulled a bonehead move for armatures when I found an Octopus that was mating with a smaller male. I had lost the use of my external viewfinder the dive before and had to rely on the top port and the small eyepiece at the back of the Beast. Well I hit the record button on the handle and must have double pushed it! The angle was tuff because it was in front of me and down in between coral heads. Well for 10 minutes I thought I was recording these two Octopi doing their thing including her pulling his arm off before he escaped into a coral head. Well I was stoked until I looked at the counter and it only had a couple more minutes on it, and sure enough I only got him crawling into the coral head at the end of the whole thing. I was sick to say the least and mad at myself and the Beast, but did not let it ruin a great trip. Live and learn, but this one I know but forgot! That won't happen again I hope! Well a whole day of diving three great meals and snacks and the day was not over yet. We watched a video before the night dive and enjoyed the Sun Deck Bar until after 11:00pm telling stories and getting to know Jennifer and Allison little better. 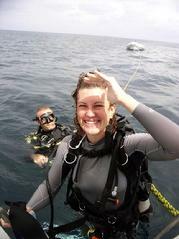 Allison fit in with our group quit well she is from New York state and getting out to dive more. The seven of us were having a great time diving and sharing stories. The weather could not have been better with soft seas and no currents. A gentle breeze to keep it comfortable even during the day in the shade and enough to dry your dive skin between dives with temps in the mid eighties it is hard to beat. When you?re this relaxed it has to be a good thing for your health. I know its good for you pictures. Every dive is now going over an hour as long as we bring back around 300psi no worries and if you're diving a computer it is your profile all the ask is depth, time, and remaining psi I think or was that last week? Oh well just dive, eat and sleep and get up and do it all over again. Monday the 28th and we motor over to Long Key Wall for the morning dives and Silver Caves hopping to find a Sea Horse for Deb who was still looking for that magical mythical creature of the sea. We found Neck Crabs by the score and Juvenal Smooth Trunkfish as well as blennies by the dozens. But no Sea Horses, although Capt. Jay did locate a Blue one on his dive (Plastica Hippocampus Reedi) that he pointed out to me and I got a picture our two of it. These walls have the best Red Purse Sponge I have seen anywhere. We were really wracking up the photos and video by the hour. This is the cleanest week you will ever spend as the two shower heads on the swim Platform got plenty of work with sometimes as many as three lined up for a wash and rinse and a warm towel. The towels and hot chocolate were ready after every night dive along with a smiling face. In addition we made popcorn almost every night to finish of the day. By the end of the second day most of use had ten dives under our belts and as far as night dives they don?t get easier and most the action is right under the boat. That's where I saw the octopi on all the dives; it acts like a full moon for the hunters. The action under the boat is hot and heavy with Tarpon and giant Grouper hunting under the light as it swings to and fro current verses wind and the force they exert on a 127ft boat. Sometimes it could take five or six minutes for the boat to cycle from one side to the other. I recruited Kevin to help me on a project that I have planned for a couple of years. He was talking about Dave's advanced class the week before and his deep dives. Kevin is in an instructor's course and has had to go deep a couple of time in California to 130 in 52* degree water and said he was not aware of being Narced at home. So he seemed to be the one for my project of putting a business card for twotankedproductions.com in the Great Blue Hole on a chain of zip ties so that others can add to it. I talked to the captain about our planned dive so he would not be worried and could keep others from following us down. It would all unfold tomorrow if we could find a place to put it, but again I am getting ahead of myself again. This kind of thing takes planning so to go with that the Captain was going to put us on Half-moon Key first and then the Blue Hole in order to give us more surface time. So we planned and chatted told stories and had popcorn until bedtime. Of course we had videos and dessert before the night dive and fun on the Sun Deck. Tuesday the 29th saw us motoring to a mooring just off Half-moon Key where we took the chase boat ashore in waves to explore the Red Footed Booby Birds sanctuary and old lighthouse. It was a leisurely trip after breakfast before it got too hot in the mid day sun. Our plan was coming together and Kevin and I were going over it as to not leave out any contingency or possible complication. The island was fun and interesting and the weather again was great. By 10:00am we were headed to the Great Blue Hole and double-checking all our equipment and the video camera as well as the attachment system we had worked out. On the way we topped off our tanks to the maximum pressure. Kevin was sure he would not feel any effects in warm clear water when he had not in cold dark water of Catalina. He and Chip had done it a couple weeks ago and Charlie was talking smack to Kevin about being deep in Roatan. So Kevin was looking forward to this challenging dive. A note about deep diving, please do not do deep unless you are trained and experienced with the right equipment, I live by the 80/80 rule which states that 80% of all life in the ocean is in the top 80ft and there is no reason to go too deep. It is not a macho stunt that should be bragged about our used to taunt dive buddies about. So we arrived and moored up at the side of the Blue Hole and as the group prepared to go down Kevin and I headed straight down the wall to find the right spot. I hit the Stalactites at 90ft and kept close to the wall that cut back toward the cavern looking for a small hold fast to attach to and rolling video as well. I passed 130ft and looked up to see the rest of the group and the bottom of the Stalactites not to far away. I was realizing that some go down over 157ft and none had the right place. At 165ft I found the right place below the largest Stalactite against the wall was a natural loop. I looked over and there was Kevin ready to go, he unclipped his pocket unzipped it and took out the card and zip ties, I pointed to the natural loop and he understood immediately. He went into action and put the chain around the loop, but was having trouble putting the end of the zip tie together. He was able to do it right so the card pointed out and up for all to see at 165ft below the large Stalactite, now he was grinning and laughing and I know he was feeling it for sure. We looked at each other with an okay, checked our gages and dropped to 171ft watching our Data Max Pro Plus II?s do things I haven't seen sense I was cave diving in Florida. I addition my Citizen Hyper Aqualand watch stopped working completely with a blank face and no readout as if the battery had died, but the morning after returning home I picked it up to take it in for repairs and it had been running for 11hrs and 15min. Deep does strange things to people and equipment. We were out of planned bottom time and started up as the rest of the group was ending their dive. We joined the group on the way up and ended with two safety stops and lots of sallow time under the boat. Forty-four minute dive to 171ft and I cam back with 1180psi as a safety margin. Well Kevin felt the effect of Nitrogen Narcosis without any question he was still smiling from ear to ear and laughing about his inability to connect the zip ties. He said he really learned something and now knows what to look for on deep dives. Again do not try this unless trained in deep diving and you know what your doing! If you are such trained please feel free to put your card on the chain carefully please and let the DM know what you are planning, no sneak dives to 165ft! We motored back towards Long Key and the site called the Cathedral were there was Green Morays and a Nurse Shark. On the way we had Cheese Burgers in Paradise with all the trimmings and trappings. It was a great morning and fun had by all and Kevin was still smiling and now eating as well, life was good and going to get better for him real soon. We hit the water and went looking for photo stuff both ways on the wall one direction per dive. More Neck Crabs and a beautiful Atlantic Oyster with a black and white mantel and a large Barracuda or two and more great sponges and soft corals along the wall than one would see in a week of diving other dive destinations. This site also has a number of swim throughs and channels that are interesting and fun to cruise through. In Belize it is the walls and yes it really is that good. A week hear is equal to three or four weeks in other parts of the Caribbean. We had a beautiful day of diving and we noticed that there were other developments occurring under our noses. Kevin and Jennifer were turning the BAIII into the Love Boat. You can find something else besides fish on a boat like this. We stopped seeing much of either one until Friday except for the dives and meals. In the mean time we were utilizing the hot tub on the Sun Deck and staying up to see Mars at its closet point to Earth in five thousand years. On the night dive I did get the video of an Octopus I wanted and was now at 14 dives on the BAIII and 15 the week before. By the time it was over I will have logged 41 dives in two weeks 84 for the year and will have done 102 dives from this boat in the last five years and should go over 4000 sense 1972 when I started. Diving has been a big part of my life and it never gets boring as long as there is new challenges and a fish or two that I still need for my library and now that I have the beast it might take me another 4000 to master it! So many places to dive and so little time, so lets dive! Wednesday the 30th with the good weather we were able to get out on the outside of the reef to Half-moon Key Wall with its large Barrel Sponges and long colorful Tube Sponges pointing out to the deep blue sea. I ran into a large Stingray and Kevin and I watched another circle and almost run into David who had his head down in his viewfinder and never saw the first Stingray at all. I approached the large animal from the side buried in the sand and he allowed me to stroke his wing until he fluttered off to reposition his self in the sand. This was about the same time half a world away that one was placing an errant barb into Steve Irwin's chest in a one in 6 billion chance shot. See on this sight my feeling for these animals. In addition to the large stuff at this site, it is a great place for Nudibranchs and Blennies. As well as a bunch of really cool swim throughs and chimneys that come out on the wall about ninety feet deep. On the inside of this reef is a sandy bottom with Turtle Grass and Garden Eels in constant movement. After the second dive we head for Painted Wall one of my all time favorites. The next three dives would be beautiful. On our first dive on the wall we found a nice Hawksbill Turtle coming right at use. It was easy to do two dives here with the cameras going either way. Again the sponges and soft corals are spectacular. I had my Octopus video and decided to sit out the night dive for some more time on the famous Sun Deck with Friends and the Hot Tub. We noticed Kevin was complaining about his ears and was starting to dive a little less, but still had that smile, was it the Great Blue Hole or something else? We all thought we knew what was causing all toughs smiles and it might be both? Another great night on the BAIII and it was occurring to us that it would be over way to fast. It was time to reflect on the great two weeks that had flown by so quickly for all of us. But it wasn't over yet still a lot of adventure left. We were already making plans for the next one as we spoke of all the fun of this one and all the great photos and video we had captured. Dive people have proven over the years as the best in getting along in limited space and making the best of sometimes very adverse conditions. They always manage smiles and are able to resolve potential conflicts before they turn into something else. Some would say it is because we only have to put up with some for a short time and that has some merit, but I feel it is something different. I think it is the things in common and that diving is not a fashion statement. Your judged on your abilities as a diver not how you look also you spend so much time on a common quest of loving the Sea and its creatures. You can always talk shop if nothing else is left. You have flaws as everyone else and they are there to see so it becomes easy to look past them and act on the positive and those things in common. I have been diving with all people with all political beliefs, just about all the races, and about every attitude you can think of and have always found common ground and friendly faces with universal smiles and warm hearts. I have had tense times at the beginning of a trip, but we have all been friends by the end of the trip. Diving is the universal diplomatic forum and really what the UN should be, bridges are built and friends made from all walks of live from Royalty to deck hand we all become equal in the water and wearing next to nothing and even sometimes even that. Snotty attitudes don't last long with snot running down your face or in your mask while you pee yourself in front of everyone. With divers you get what you see, just people who love the sport, the adventure, and the Sea and water and all that live in it! 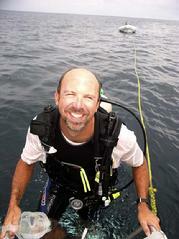 Thursday the 31st finds us back outside the Atoll at Tarpon Cavern for our morning dives. These are spectacular wall dives with a chance to see big animals. I dropped into Tarpon Cavern to find a Hawks Bill turtle on the bottom and followed it with my video for a quarter mile or so at a leisurely pace allowing me to shot it from all angles possible until I realized I had gone south for quite a while and started to work my way back along the top of the wall. Doc, Deb and John were always around doing their thing on the walls, we were always crossing paths or going the same way at one time or another. Doc has recently gotten into the photography and has taken my class and is in the process of improving her skills. She is finding a passion in her diving with her photography and I recommend it to any diver wanting to improve their skills and challenge themselves in the process. After lunch we headed for Quebrada and a very spectacular wall with unique reef life and Macro heaven. Lots to video and photo here with great results. Everyone was buzzing about how beautiful this site was and all the neat little critters. Sailor Knots on Gorgonians but only a certain one and Arrow Blennies on the wall with sponges and soft corals as far as the eye could see and Scorpion Fish hiding in plain sight. It just keeps getting better and there seems to be no let down in our schedule of finding really cool critters and those things on my list for the Beast. Lost of good video in HD from these two weeks and that?s a fact! Captain Jay gave us a choice to motor back to Turneffe Atoll for the afternoon and night dive and then get in a transitional dive the next morning at 5:30am. So we headed across to Turneffe and the Front Porch for the afternoon dive and night dive. Here we were on the hunt for the White Spotted Toadfish and it wasn't long before we spotted on under a ledge but he was too far under for a good shot. Deb, Doc & I went in and headed toward the shallows and sure enough under a coral head in 30ft of water was a nice size Toadfish only found at Turneffe Atoll in Belize and we all took turns getting it in the cameras. This was my fifth dive of the day and decided that my ears where now really feeling it. So another night on the Sun Deck with Allison, Deb, Doc, and friends how could you go wrong? That was a word left out this last week and the only thing was tomorrow was the last dive day. Friday the 1st September dawns and John and a couple others got up and were in the water by 5:30am, but not me or my ears! I figured I would have at least one more in me before it was over. So I was out on deck a little early to see the transitional divers and what they were doing. I watched over the side and saw the lights below dim as the dawn became stronger as the sun rose above the horizon. The Captain said it was a little green here for a day dive and wanted to try another place around Turneffe and we set out once the divers were back aboard. By the time we were at the new sit we had done breakfast and were ready to go. At the briefing we were given a map that was not close to the bottom we encountered. Deb, Doc, John, and myself found a beautiful slopping wall with sponges and Giant Anemones as well as huge Barrel Sponges. Once back on board we pointed it out to the crew and the others that didn't?t see much on their dive. The next one I was not going to do, but Allison wanted to dive with me before the week was over so I sucked it up and went for one more my 26th for the week. Allison was a great buddy and I was able to get some good pictures of her. Deb and John have become really good divers over the last three years and especially Deb who I head to take by the hand to get her through the Cathedral in Spooky Channel to doing Swim throughs without thinking about as long as she can see light at the other end, and she does it without kicking up the bottom despite her Split Fins. I would go anywhere with any of our divers and they just keep improving. That is what diving will do for you nothing replaces experience and divers like Doc Sharon has come a long way in the last four years and I would dive with her any time or place. A person pays a lot of money and personal investment in time to travel to exotic places and shouldn't be expected to baby set, unless they want to, a buddy that is not of your caliber. You should get the most out of every dive that you are paying for and I will not dive with operations that buddy you up with under skilled or inexperienced divers. My time and money are too important and you can never get back time thrown away on a dive made bad by such a buddy. I don't allow this kind of experience and hope no one else will either. I enjoyed every dive I made in the last two weeks. Thanks to Deb, John, Doc, Jennifer, Allison, and my deep Buddy Kevin for a great week on the BAIII. The adventure was not over yet! On the way back in to the dock we ate our last lunch on the Sun Deck for a while and went over or plans for the next two days. We broke down our gear and put away our weights for the next cruisers. I broke down all my camera equipment except one strobe and my L & M still housing. I was taking it to the next adventure. I want to tank Mark for lending me a bulkhead plug so that one flash did not have to go. We got back to the dock about 12:00pm and left the boat at 12:30pm and just as he had said Jim was waiting for us on the street. We were heading, minus Kevin, to Jaguar Paw about an hour south on the main highway. This has become the most popular day excursion of all the cruise ships. Again we were thankful for Jim and Maria and it being Friday. We turned of the main road on to the dirt road and headed for the paring lot a couple miles in. we meet or guide there that Jim had arranged for us and grabbed an inner tube and a head light. We were now treated to a 1-hour walk into the jungle along a trail that crossed the river and took us through a cave system and then into the jungle. Our guide showed us Bats, Ants, and Foliage used by the Belizeans for every use under the Sun. He also cut us some Sugar Cane to munch on during the hike. In about an hour we come to a set of steps into the river basin. We put our tubes in and some decided to jump in the river and then get in the tube for the hour plus trip under ground on this real Lazy River. From the first time I did this trip four years ago I had though that Walt had based The Pirates of the Caribbean on this river, it is and has everything and then some and it's not on a track either. This is pure fun and adventure for all ages not to mention how beautiful it is. You travel through the caves and see where to underground rivers come together with a waterfall and an area that looks like something out of Jurassic Park. The housed cameras work well and you have pictures to show all your friends even though there is no way to describe this trip and do it justice. Then we were back where we started near the steps to the parking lot where we crossed the river on the way out. Jim gave the guide a ride to the main highway to catch the bus. We thanked him for the trip and headed back to the boat. We got there just after the cheese & wine party, but in time for dinner at Harbor View a very nice steak and seafood restaurant over looking the entrance to the river and what they call a harbor. After a good dinner, a little pricey but substantial and filling, we headed back to our last night on the Sun Deck. When Jim dropped us off we told him to meet us at 8:30am for our trip to the Baboon Sanctuary that he had arranged for us. We all reminisced about all the good diving and photos we had gotten and how long it would take to organize and crop all the hundreds of pictures. In addition I reminded them of all the video that would have to be cataloged and this very log that had to be formalized and published. Saturday September 2nd arrived early, as we had to be up and off the boat by 8:30am with all our gear, although you can store it all at the dock and they will watch it and cover it if it rains. So we took what we needed for our trip to the jungle again and headed for the curb where Jim was right on time to load all of us plus Allison into the van. It was about an hour plus to Jim's pre-arranged guide for our Howler Monkey watching adventure. The guide met us and right across the road in the trees was a tribe of monkeys howling and swinging in the top of the trees. We were given a great tour and the guide got a little female Howler to come right down and take some banana right out of our hands. Again Jim had come through for us and everyone raved about the trip. It was time to head back grab some lunch and head for the airport. We reflected on, here we were in a Belizean Jungle in the morning, and would be sleeping in our own beds that night! Stay tuned to the next adventures!